Welcome to the Rabbit Gallery and to my collection of rabbits! I don't even know how many bunnies I have in my warren since I started collecting them a long time ago. So I've started this project to photograph all of them. I'm thinking it's going to take some time. And I hope it will be a never-ending project, because I would love to add even more bunnies! One can never have too many! This is a little bunny bud vase. 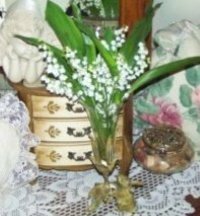 One year, I had the most beautiful lilies-of-the-valley in my garden, so I picked some and put them in my bunny vase on top of my bedroom dresser. They smelled so sweet! I think we should all give ourselves flowers every once in a while. 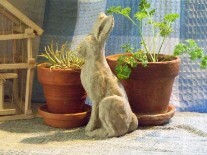 A tiny cement bunny keeps my indoor herb garden company.